It’s the beginning of 2013, and culinary publications are starting to forecast the coming “food trends” for the new year. Last year could have been called “The Year of Kale,” as this ancient superfood drew attention for its powerful nutritional qualities. Even I fell under kale’s spell after learning the miracle of the kale massage. There was also a continued emphasis on local, seasonal and sustainable foods. Gourmet donuts proved popular, and of course California saw the fall of foie gras. So what’s in store for 2013? This year, foodie journalists predict that vegetarian food, popcorn and chicken will rise in popularity. There is also a “new” food trend with ancient roots that has piqued my interest—fermentation. If you’re unfamiliar with the process of food fermentation, it began centuries ago as a way of preserving and safely extending food’s shelf life without the use of modern appliances. The history stretches back to 6,000 B.C., where fermentation was used to make beer by the Babylonians and Sumerians. Around 4,000 B.C., the Chinese began preserving milk with lactic acid bacteria, resulting in yogurt. Since that time, nearly every country and culture has developed a fermented food product, from kimchi in Korea to miso in Japan to chutneys in India. Fermentation requires you to combine certain fruits or vegetables, such as lemons, berries, cabbage, beets and carrots, with salt and herbs. Once combined, the ingredients are allowed to sit in their own juices. Over time, lactic microbial organisms, much like the kind that will cause milk to curdle, develop. These organisms turn the naturally occurring sugars of the foods into lactic acid. In turn, the environment becomes so acid, so quickly, that it is no longer possible for any spoiling bacteria to multiply. Home canning and preserving has been on the rise for the past several years, but fermentation is only recently experiencing a resurgence. Perhaps it’s because the process flies in the face of the food hygiene laws we’ve spent our whole lives learning about. The idea of leaving food to sit without any source of heat or cold seems strange—we are, in essence, encouraging organisms to grow in our food. The truth is, the concept isn’t really that strange, and it’s been around a lot longer than refrigeration has. 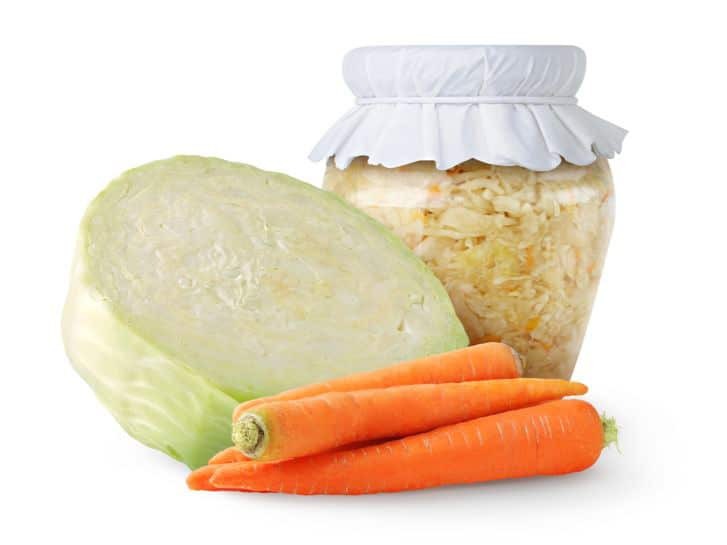 Most of us are familiar with certain fermented foods like sauerkraut, but we don’t really think of them as being “fermented.” Knowing that fermentation can extend to most vegetables and fruits gives us an opportunity to try this food preservation method on a larger scale. What I found most compelling about fermentation is the many health benefits it offers. In 2012, probiotics gained attention as an important part of the human diet. Natural sources of probiotics include fermented dairy products like yogurt and kefir. The production of enzymes, vitamins and probiotics created through fermentation are said to help with digestion in addition to having medicinal properties. Evidence suggests that certain probiotic strains contribute to the microbial balance in your digestive system, which reduces inflammation and supports the immune system. Sounds pretty good, right? But what is the flavor like? Fermented foods tend to have a more acidic taste because of the increased acid that develops during the process. The flavor changes depending on how long the food is allowed to ferment. While I haven’t done a lot of fermenting myself, I am interested to try the process with some different foods to see what the flavor results are like. So what do you think? Fermented food for the win? Or does the idea make you slightly queasy? Have you fermented food before? Personally I am drawn to this method of food preservation because of its historical roots. Though spring is still a few months away, it’s not too early to think about extending the shelf life of your garden fruits and veggies. Would you be interested in learning more about the process here on the Shiksa blog? Let me know in the comments if you’d like me to post a fermentation tutorial. I would love to receive a tutorial on fermentation, of veggie and fruit. I am living in Japan and there are many fermentation food here. Miso, Natto, Koji, Soy-souce and so on. It is really interesting to study about fermentation food. Thanks! Yes! I’d love to hear about your adventures in fermentation. I just started making kambucha, piima cream and fermented veggies and am looking for ways to be creative with it. Found “Nourishing Traditions” to be a wonderful guide. Just discovered your site and am very impressed. Making your hamantaschen as I write. I will definitely be exploring your site. Thanks so much! Please do postings on “Fermentation”. I grew up with a mother making her own pickles and kraut. Two years ago I started canning and absolutely love it. I would like to know more about fermentation and to get involved. I did make pickles, chow chow, chili sauce last year and they are great. I find all things cooking, canning, etc. very relaxing and fun. I grew up in the South and am trying to resurrect some of my old family recipes. I have made yoghurt since I was in graduate school and love to brine pickles. I have some salted lemons and torshi left going in my cabinet right now. Can’t wait to see what you publish on this! Just started fermenting for health reasons. It has really helped with acid reflux and IBS. The Cultured Food life site has many articles on it and she has her own health story. Homemade Kefir is delicious and has many more probiotics than regular yogurt. Wow wished I learned about this years ago. Ive really not done any fermentation but have been reading about it in Donna Gates’ Body Ecology Diet. I love cultured yogurts kefir yogurt drinks etc and we used to have a German restaurant that made the most awesome homemade sourkraut – waaaay better than store boughten canned/jarred sourkraut. I also like kimchi and Miso and all the yummy stuff found in restaurants. I like je idea of it being around since the dawn of time, and with one never knowing what disaster will take out the power grid, seems like a useful skill to know and do. My husband grew up in Middle East where fermenting/pickling is a way of life! He was so disappointed that it’s not popular here. I’ve been wanting to learn but it seems like a big learning curve, I’ll have to give it a go! There was a great article in the November 22, 2010 issue of The New Yorker magazine about fermentation by Berkard Bilger, called “Nature’s Spoils.” In the same issue was a recipe (sort of a reminiscence about) pickled cabbage by David Bezmozgis. Worth the read! Fermentation is a great adventure. At home I have my own kefir, mother dough and sauerkraut too. All of them need some time to feed and maintain, but the results are great. We bake bread every 2-3 days from the mother-dough. Was a miracle to see only water and rye flour to ferment over several days, then mature and become a sort of a tamagochi. But the bread made of such yeast is completely different from the one you buy in shops. Not to talk about the fact, that fermentation is a whole science. Some even say, that proper fermentation can make normal bread edible even for people with gluten-intolerancy, because the long fermentation process breaks gluten apart and makes it digestible. That is by the way the biggest point of every fermentation, to break it up so that we can digest food. Anyway, looking forward to your notes on this topic. Tori, have you done a history search on both canning and fermentation? It is a very interesting study. Actually fermenting is a very safe process, safer than canning plain veggies. I know how you enjoy food history so I can’t wait to hear what you do with these two intertwined topics. Tori you are so refreshing and such an inpiration!! Sometimes I feel like you are reading my mind. I was in the mood for barley mushroom soup when it was in your blog and I had all of the ingredients. Now I am eating a bowl of it while I read your article on fermentation while taking a break before my next task which is making turnip pickles! Can’t wait to learn more about fermentation – it’s one of my resolutions! Won’t mention the 3 heads of cauliflower I want to use for the two of us when I read your alfredo cauliflower earlier today or you will think I’m a Tori groupie!!! OK and now that I just had my big birthday can I say that I love when your posts send me to the dictionary and the encyclopedia so I just have to mention, love when my interest is piqued! I have tried this once right before Thanksgiving with a combination of cabbage, carrots, apples, cucumbers and herbs. It was delicious! I hear 1/4 cup a day is all you need to gain the health benefits. I need to make another batch. I did it with a friend, and it was a lot of fun and less work doing it with two. Years ago I learned how to make fermented eggplant (Makdous), stuffed with salted and garlicky walnuts and hot red peppers. When you eat it you mash it up with olive oil and serve it with pita bread. It is a popular middle eastern appetizer/snack, and my stepmother taught me (she’s from Syria). I feel tempted and sceptical about fermentation. It really attracts me, because I’ve a lot to learn about. Meanwhile, I’m scared of its associated potential side effects in case of bad fermentation. I feel comfortable about natural leavening, less with preservation homemake. I thinks it’s more a matter of habit, I must get used to it. Yes, I’d like to learn more abut fermentation as a method of preserving food from my garden. I would take fermented foods over sweets any day! I grew up canning with my mom and grandmother. Sauerkraut, chow chows, fermented veggies of every type were normal for me and for my children it is just part of life. My neighbors are use to my jars of lemon pickles fermenting on the porch in the sun, the tomatoes and pickles and so forth because I mostly can outside in the summer months to keep the heat out of the house. My husband and kids love kombucha teas as well. I use to make dairy cheeses and yogurts, having raised goats, feta was my favorite. Then last June my family went vegan and I thought I had lost that love, but Miyoko Schriner’s newest book has given me back my love for this art in a whole new way!! Now I make soy yogurt, sour cream, also cheeses of all kinds! This is fermentation as well. I’d love to hear about it as you experiment. Fermented beaver tail has been associated with deaths from botulism. Have there been other fermented foods responsible for illness or death? Hi Kevin. 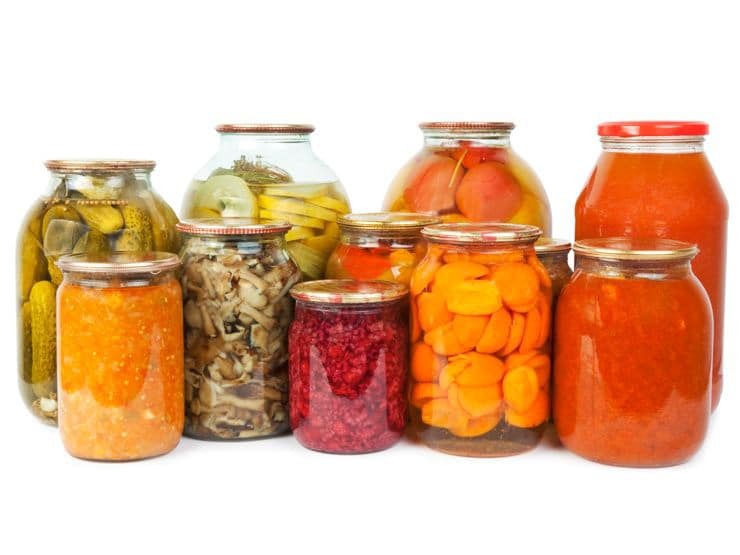 I don’t know the answer to that, but I do know that the USDA and FDA recommend canning fermented foods in a hot water bath for protection against botulism. Not everybody follows those guidelines, though. According the USDA and Sandor Katz, there has never been a case of food poisoning from fermented vegetables. Fermented meat and dairy have slightly higher risks, but in general the risks seem pretty low if properly fermenting foods. Yes, please do a segment on fermented foods. I would like to try carrots. Would love to learn more about fermenting. I grew up making sauerkraut with my grandparents, but I am very interested in fermenting other veggies because of the tremendous health benefits. I love all of the history of food, and enjoy your writings very much! So glad you wrote about this! With the recent changes in the economy here in the US, I’ve been interested in learning ways to start my own garden, learn canning and fermenting foods. My grandma had perfected the canning process… Wish I had paid more attention! Can’t wait to read more as you dive in! Thanks for all you do! Shalom! I have been fermenting for the past few years–mostly sauerkraut. It is far tastier that what you can buy. I would interested to learn more and expand my recipes. I am always looking for “new” interesting ways to prepare food! sometimes my husband thinks i’m a bit looney (i clean the house mostly with vinegar and baking soda combinations), but i think it’s fun! please do share some recipes and techniques. Your how-tos are some of the best on the internet and i absolutely love your blog. Thanks for the feedback Sara! It appears there is definitely some interest here, so I have put it on the schedule for spring. I love the health benefits of drinking Kombucha, so why not add some fermented foods? I grew up in Poland where fermenting food was and still is very popular. We mostly fermented pickles, kraut and beets. Borsht made by fermenting beets with veggies has been traditional Christmas Eve dish in my family. I would like to find out more about fermenting different types of food. I love your blog very much! I would love for you to post about fermentation. I have recently started to make my own whey and cream cheese from raw milk, and have also taken a crack at kimchi. I love the bite of fermented foods as a condiment! We’ve been brewing our own beer and making our own yoghurt (much tastier than the commercial stuff!). I hate wasting food but sometimes just have to throw away some of our organic fruits and vegs as they don’t last as long. Knowing how to extend their shelf life would be great! Agreed Meline, that is one drawback of organic foods. Didn’t think about how fermentation would help with this… great point! So cool Lorraine! What kinds of foods did you grow up fermenting?